It’s not as hard as it looks. You can figure this out! 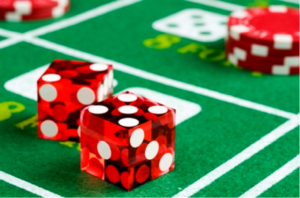 Have you read our previous post on “The Way to Play: Craps”? If not, please click on the previous link forthwith. If you have, however, get ready for more mind-blowing info. Last time, we covered some basic vocabulary and the pass / don’t pass line. This time around, we’re going to start with some random rules of etiquette before moving into “come” bets, “place” bets and “prop” bets. Remember this will seem daunting; there’s a lot of information. But don’t give up! Craps is about as much fun as you can have at a casino (or anywhere, really). And if the action gets hot, remember the dealers at your favorite Suquamish casino are always willing to answer your questions! The shooter must roll the dice with one hand. The dice must be thrown into the air and bounce off the opposite wall of the table. You should keep your hands at the side of table to avoid interfering with the roll. Cheering is acceptable IF you are rooting for the shooter. If not, you better remain quiet! Don’t hand money to the dealer (he or she is not permitted to touch the cash). Place it on the table. It is acceptable for you to place your chips when making pass, come and field bets. Everything else should be placed in front of you to be distributed by the dealer. 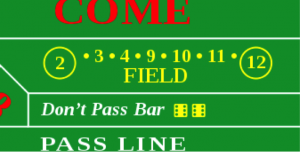 The Come bet operates in much the same way as the Pass bet, except that it’s specific to the player who makes it. It can only be placed after the table point has been established. If on the first toss after placing the Come bet a 7 or 11 is rolled, the player who placed the bet wins. Just as with a Pass bet, however, a roll of 2, 3 or 10 loses. If any other number comes up (4, 5, 6, 8, 9, 12), that number must be replicated before a 7 is rolled in order for the player to win. Betting the field is wagering that one of the following numbers will come up on the next roll: 2, 3, 4, 9, 10, 11 or 12. A Place bet is a bet on a specific number for a specific roll. The odds change based on the number you’ve chosen. A Prop bet is a wager not only that a certain number will be rolled, but HOW it will be rolled. For example, if you bet on making “6 the hard way,” you are saying you believe the shooter will roll a 6 from a pair of 3s on the next toss. If the dice come up 2 and 4, you lose. Keep in mind the best bets statistically are the Pass and Come line bets; however, if your Prop bet hits, the odds make it incredibly lucrative.